JNN 16 June 2014 NAIROBI, Kenya — Dozens of Wahabi Terrorists wielding automatic weapons attacked a small Kenyan coastal town for hours, assaulting the police station, setting two hotels on fire, and spraying bullets into the street. At least 48 people were killed, officials said Monday. The assault in Mpeketoni began around 8 p.m. local time on Sunday night as residents were watching World Cup matches on TV and lasted until early Monday, meeting little resistance from Kenya’s security forces. At the Breeze View Hotel, the gunmen pulled the men aside and ordered the women to watch as they killed them, saying it was what Kenyan troops are doing to Somali men inside Somalia, a police commander said on condition of anonymity because he was not authorized to share that detail of the attack. “Attackers hijacked a van from Witu town, which they used for the attacks. They raided Mpeketoni police station first and opened fire,” said Mpeketoni area administration police chief Hamaton Mwaliko. 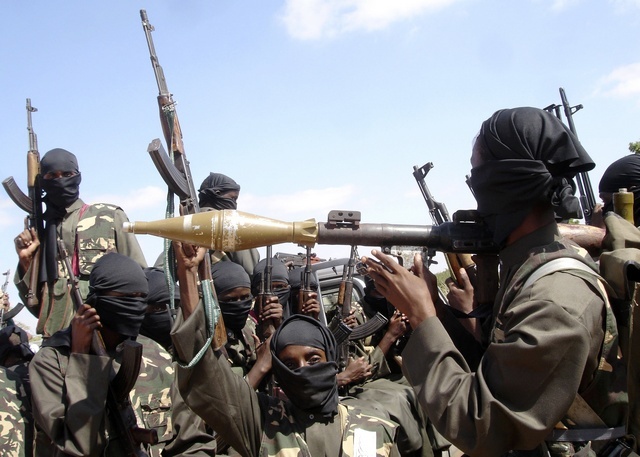 Authorities blamed al-Shabab, Somalia’s al-Qaida-linked terror group, who have vowed to carry out terror attacks to avenge the Kenyan military presence in Somali. Along with its Somali fighters, the group also has many Kenyan adherents. Kenya’s top police commander, David Kimaiyo, said the death toll was 48. Mpeketoni is about 20 miles (30 kilometers) southwest of the tourist center of Lamu. Any tourism in Mpeketoni is mostly local, with few foreigners visiting the region. The town is about 60 miles (100 kilometers) from the Somali border. Mpeketoni is about 360 miles (600 kilometers) from the capital, Nairobi. At least 67 people were killed in September when four al-Shabab Terrorists attacked an upscale mall in the Kenyan capital, Nairobi. Kenya sent it troops to Somalia in October 2011. This entry was posted in AFRICA and tagged 8th Rabi ul Awal, Al Shabab Terrorists, Hotels, Kenya, Lamu, Mpeketoni, Nairobi, Police Stations, Somalia. Bookmark the permalink.